Using Ward's safe and nontoxic simulated blood, students can simulate a blood-typing experiment and delve into the concepts of Rh typing. 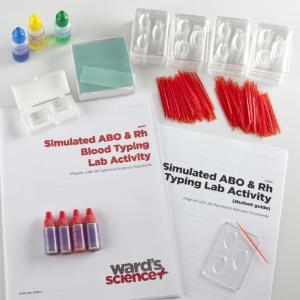 Upon completion of this kit, students will have typed an unknown sample of blood. During this process, they employ the basic science framework concepts of Structures and Properties (LS1) and Heredity (LS3) to examine the risks of Rh incompatibilities and view simulated red and white blood cells under a microscope. This kit aligns with all published National Standards. Pre and post-laboratory assessments and vocabulary words target specific Science and Engineering Practices and Common Core Standards. Accessories information: Refill kit includes simulated blood samples and antisera. Ordering information: This kit contains one bottle each of Ward's Simulated Blood: Mr. Smith, Mr. Jones, Mr. Green, and Ms. Brown. Simulated anti-A serum, simulated anti-B serum, simulated anti-Rh serum, 48 blood-typing slides, 200 toothpicks, one package of microscope slides, one package of coverslips, a teacher's guide, and a student's copymaster are also included. Compound microscopes (400x magnification) and markers are not included.